A remote astronomical telescope can be controlled off-site by an observer over the Internet, and is housed in an observatory with an automated system for opening and closing the roof. All systems are mechanical and controlled by computer. The telescope is also capable of being programmed to operate robotically with preset commands with no human interaction. The main telescope chosen by the KAS is a PlaneWave Corrected Dall-Kirkham (CDK) reflector containing a 20-inch quartz primary mirror. We were fortunate to be able to go with the quartz mirror as it is a significant upgrade from the Pyrex mirror that is standard equipment on this model. Quartz is less prone to expansion and contraction from ambient temperature differences and significantly improves image quality. The telescope also has a carbon fiber light shroud and a dual carbon fiber truss design that minimizes thermal expansion which can cause focus shift with changes in temperature. One of the exceptional features of the CDK20 is that it is an instrument that accommodates our project budget and has a large enough imaging plane for the large format CCD camera that is part of our system. The telescope measures 47 inches in length and weighs 140 pounds. Mounted atop the CDK20 is a Takahashi FSQ-106EDX3 refractor. Constructed especially for digital imaging from the ground up, it is an exceptional flat-field super quadruplet astrograph refractor that enables pinpoint stars along with enhanced field illumination. Our FSQ-106 utilizes the identical CCD camera and filters used on the CDK20. Both the CDK20 and FSQ-106 ride atop a Paramount ME II German equatorial mount by Software Bisque. Again, the KAS chose this mount because of its exceptional quality and durability; like a watch a mount needs to be steady and accurate. It has a very high accuracy in positioning the telescope, is robust enough for our significant equipment load and can position the telescope in a large sweeping arc across the sky. It also is a magnificent shade of gleaming crimson! Controlling the telescope as well as transferring the images and data back to southwest Michigan is accomplished with basic off the shelf computer hardware. The software however is specialized for use in a remote observatory. It controls all the basic commands for the telescope, including focusing, imaging and guiding and will enable transmitting information from the telescope via the Internet. In addition, it will oversee and control observatory systems such as the roll-off roof mechanism. 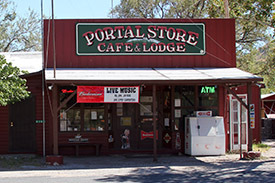 Arizona Sky Village (ASV) is located 1.75 miles northeast of Portal, Arizona (a town of about 100 people) and 109 miles east-southeast of Tucson. 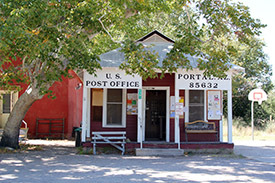 It was founded by noted astrophotographer Jack Newton and developer Gene Turner in 2003. ASV is 450 acres in size and sits in the foothills of the Chiricahua Mountains at the mouth of Cave Creek Canyon. It contains 85 lots and 11 time-share haciendas. In addition to being an excellent site for astronomy, ASV is one of the premiere bird-watching locations in North America. ASV is 4,600 feet above sea level, ensuring low humidity. The average high temperatures range from 90º F in the summer and 58º F in the winter. Total annual precipitation is only 17.4 inches, most of which is during the monsoon season from mid-June to mid-August. The region boasts at least 300 clear nights a year (compared to only 70 for Michigan). 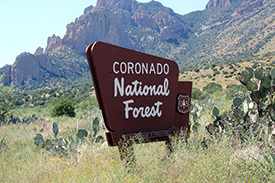 The Coronado National Forest is just west of ASV and is about 1.78 million acres in size. National forest land cannot be developed, so ASV will stay dark for the foreseeable future. How dark are the night skies above the ASV? According to the Clear Sky Chart light pollution rating, ASV ranks 2 on the Bortle Scale. Phenomena like gegenschein is visible and the zodiacal lights can be annoyingly bright. The Milky Way casts shadows and clouds look like black holes in the sky. The limiting naked eye magnitude is better than 7. The KAS Remote Telescope was made possible because of generous donations and grants from our members, local institutions, and the general public. In all, we raised over $122,000 during our 7-year fundraising campaign that began in 2011 (the majority of those contributions came from our own membership). Thank you to everyone that supported this historic project.